This monster is so cute that she can get away with mischief! 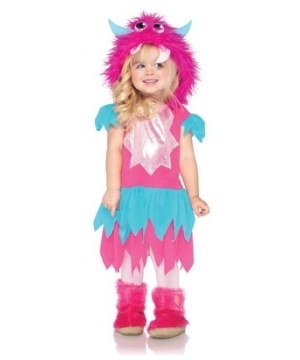 Mischief Monster Teen Costume includes a cute pink and aqua dress with zig zag multi tiered skirt and a furry pink monster hood with pom pom ties. This colorful Teen Costume for girls is available in teen sizes Small/Medium (10-12) and Medium/Large (12-14). Please note stockings, pink furry leg warmers, shoes, makeup, and wig are not included. Review(s) for " Mischief Monster Teen Costume"